I argued previously that private hospitals could play an important role in reducing hospital wait times and may result in greater efficiencies in the Canadian healthcare system. Yet, skepticism toward private-sector involvement is rife in Canada and many folks believe that it could create a more inequitable healthcare system. In fact, one pundit argues that provincial governments need to further consolidate their control over healthcare. The widespread negative perception of “private healthcare” in the United States reinforces the skepticism that most Canadians have toward private-sector inolvement, which is the subject of health economist Audrey Laporte’s new study, “How Markets Can Put Patients First: Economics Before Politics in Canadian Healthcare Delivery.” This study argues that “Historically, the tendency among Canadian health policy analysts and policymakers has been to compare Medicare with the American system and to conclude that since we are doing much better than Americans in so many of the standard metrics used to judge healthcare systems, notably cost and various measures of access to care, we don’t need to consider making any significant changes to the structure of Medicare.” Nevertheless, comparing Canada’s healthcare system to that of the United States is a fallacy of composition, which is when someone has a distorted belief that what is true in one instance is true in all instances. In the last decade, Canadian health expenditures have skyrocketed and one estimate shows that “total public health spending has grown at an average annual rate of 7.5 per cent.” Excluding federal transfers, roughly 88 per cent of Nova Scotia’s provincial revenues pay for healthcare services on an annual basis. Yet, despite these enormous outlays, Nova Scotia ranks last in hospital wait times. One of the problems facing the Canadian healthcare system is that provincial governments determine the price of healthcare services behind the scenes and patients (who double as taxpayers) remain uninformed. Essentially, the monopolistic structure of Canada’s healthcare system results in limited choices for Canadians seeking medical care and the result is longer wait times and poorer outcomes. In fact, there has been a surge of Canadians who are seeking medical treatment abroad, which indicates that there is room for improvement. An alternative system that provided more options to individuals seeking healthcare would be a huge improvement. According to the Health Council of Canada’s 2007 survey, 47 per cent of the sample population like the idea of having private hospitals in Canada and 67 per cent felt that the Chaoulli decision was the key to two-tier healthcare. Indeed, the coexistence of publicly- and privately-operated hospitals will create efficiencies by reducing wait times as has happened in other developed countries. These countries, such as the Netherlands, Switzerland, and France, boast healthcare systems similar to that of Canada’s, but with a few subtle improvements–including two-tier healthcare. In the Netherlands, for instance, there were 151 hospitals and 52 outpatient clinic owned by 93 private organizations in 2010 and Dutch citizens reported much better outcomes than Canadian citizens: 41 per cent of Canadians reported waiting longer than four months for a surgery compared with 5 per cent in the Netherlands. Given the inefficiencies plaguing Canada’s healthcare system, the time is ripe to change the status quo such that all Canadians receive quality medical treatment in a timely manner. One small step toward achieving this objective would be to allow private health insurance, which would ensure that all Canadian citizens have equitable access to healthcare. Many countries have experienced rising healthcare costs in recent decades and this phenomenon has stimulated a lively debate about the policy options available to governments for mitigating those costs. In Canada, per capita public healthcare expenditures will be roughly $6,057 in 2014–reflecting a staggering total of $215 billion that year. 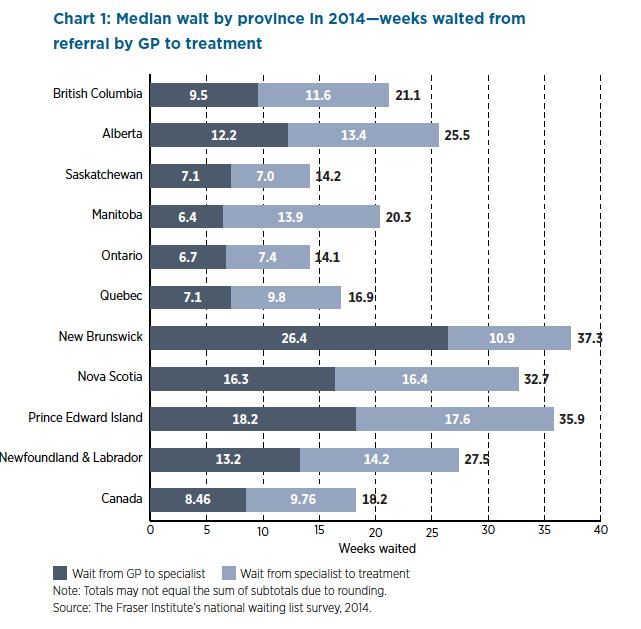 In 2014, the Fraser Institute released a study, titled “Waiting your Turn: Wait Times for Health Care in Canada,” that reveals the median waiting time for medically-necessary treatments in Canada to be 18.2 weeks, which is significantly higher than other OECD countries. Echoing this assessment of Canada’s public healthcare system, the Common Wealth Fund (CWF) published a report recently that ranks Canada last in terms of “timely access to healthcare.” Nova Scotia’s average wait time is 32.7 weeks, which is considerably higher than in other provinces. (In Ontario, for instance, the average wait time is 14.1 weeks.) Health Minister Leo Glavine recently admitted that Nova Scotians wait too long for basic medical procedures, and although he touched upon the impact of unions in the province, the provincial government is primarily responsible for healthcare outcomes in Nova Scotia. Eliminating restrictions that prevent individuals from accessing private healthcare, which would theoretically reduce the burden shouldered by the public healthcare system, is one option available to the provincial government in Nova Scotia. More broadly, implementing measures that facilitate private sector involvement in the province’s healthcare sector would serve to reduce wait times, increase accessibility, and improve healthcare outcomes for all residents in the province. However, in my future blog, I can discuss more about the importance of private sector involvement and its positive impacts on reducing waiting time.